One of the most important measures taken in connection with the work of advertising, was the adoption of an official Poster. After a thorough examination of several sketches sent in, and after having conferred with prominent Swedish artists in the matter, the Swedish Olympic Committee, at a meeting held on the 27 June, 1911, determined to accept the poster by Olle Hjortzberg, of the Royal Academy, which had been sent in to the Committee in 1910, but had afterwards been slightly altered, representing the march of the nations - each athlete with a waving flag - to the common goal of the Olympic Games. 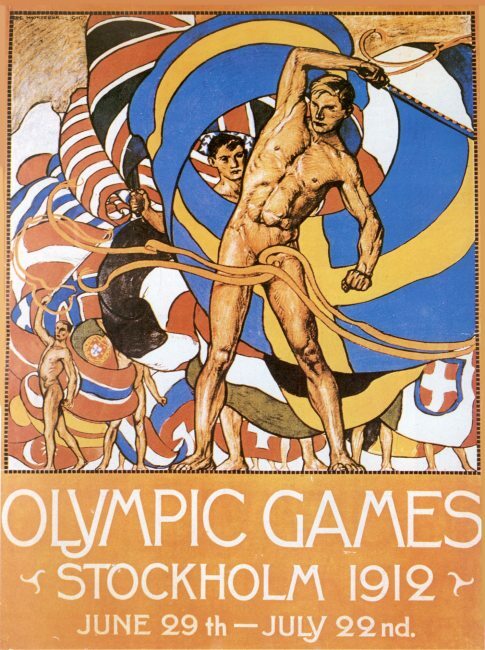 Thorsten Schonberg's poster was placed second, this design representing the entrance of a Marathon runner into the festively decorated Stadium, while, as number three, came Axel Törneman's poster, a javelin-thrower, with the Stadium in the background. The poster, the execution of which was confided to A. Börtzell's Printing Co., Stockholm, was in seven colours, the size being cm. 75,5 × 107 cm. A proof was sent by the firm in the middle of October, 1911, after which the chief part of the order was completed during the course of the next three months, but it was found necessary to order additional copies, to satisfy the large demand for the placard received from various quarters. The same step had to be taken with regard to the advertising stamp, the advertising pamphlet and the general programme.